So for the first requirement, I went to https://www.passport.gov.ph/ for my online appointment. As I was looking at DFA's appointment schedules for December 2018, there were only weekday schedules para sa malalapit na DFA Consular sa amin. This was way back in November 2018. 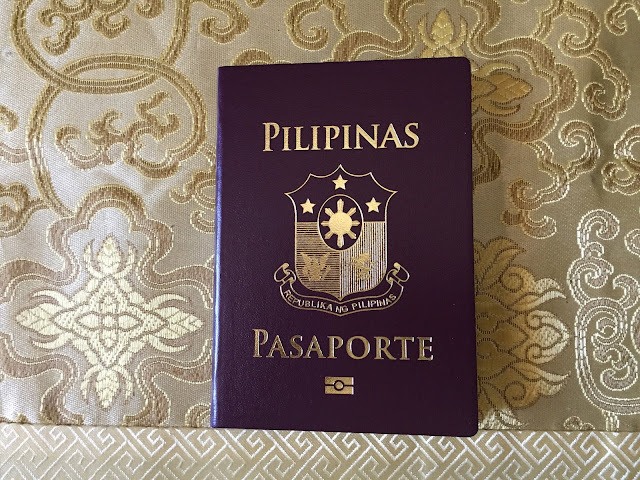 The rest of our Pabeeda group says so that there's only weekday schedules for appointment, but based on Diane's experience, who got her passport just last June 2018, she got hers on Saturday. 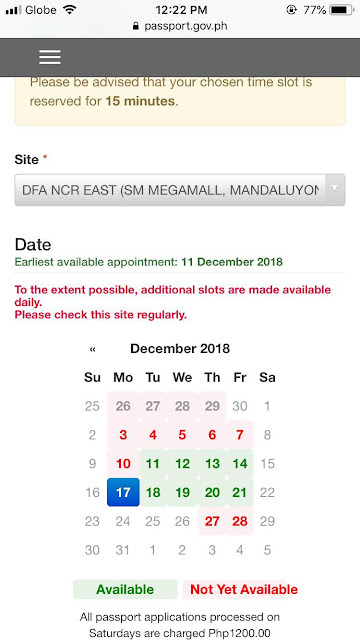 And I believe so, because as you can see in DFA's passport application page, it was noted that "All passport applications processed on Saturdays are charged Php1,200"
So what I did was I checked back every now and then to look at the schedules. And come December, as I checked back as I usually do, I saw Saturday schedules for the month! 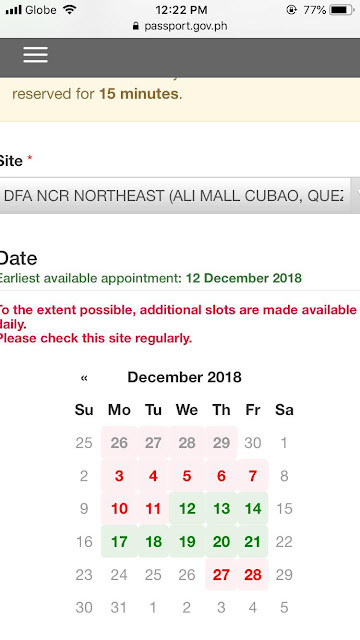 I booked my appointment for 29th of December, DFA NCR East (SM Megamall), 10:00 AM to 11:00 AM. Just had to fill in my personal information within the site as I continue with the booking. As well as my family's information. And lastly, my contact information. The next page shows the summary of the information I entered. I just reviewed it carefully and proceeded. which automatically makes it an expedite. I just checked "I Agree" and tapped again on the Proceed to Payment button. After choosing to Proceed, I received my Payment reference in my email which contains the Reference number which I will use to pay for the fee and Payment Instructions. And I rushed to pay the fee within 24 hrs. This was the time when I was having trouble with GCash so I had to go out and pay on DFA's accredited partners after I logged off from work at 6 PM. I first went to SM Hypermarket (just outside of our subdivision), but their Bills Center is not accepting payment for DFA Passport application. So my second option is to go to Robinsons and pay in their customer service center. Just when I reached the Customer Service Center, it was already past 7 PM and the cashier said the cutoff time for payment is at 7:00 PM. Paktay! Then I thought of 7-Eleven store in Sta. Lucia East Grand mall, so I went there para subukang magbayad. Sa wakas, sa lahat ng napuntahan ko, sa 7-Eleven pa ako nakapagbayad. 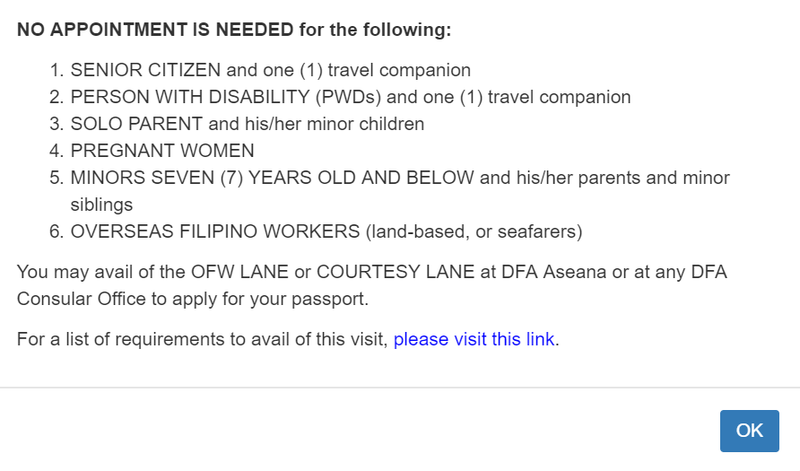 After paying, I received an email from DFA about my successful payment. Come 29th of December, I went with my aunt as she's going to renew her passport as well. She didn't need to schedule an appointment dahil pasok siya sa criteria na makakagamit ng Courtesy lane. I do not meet the "one (1) travel companion" criteria that's why I had to schedule my appointment. You can check out their link to read more about the details of the courtesy lane. We arrived around 9:30AM and already had to line up in front of SM Megamall Bldg C (This is beside the bus stop). As we are nearing the scheduled time of 10:00 AM mas lalong humahaba na ang pila sa labas. We were able to ride the elevator at 10:00 AM (actually nauna nang nakasakay si auntie dahil senior citizen eh) so naiwan ako sa next batch na sasakay ng elevator but no worries dahil almost all of us are heading to DFA. Pagbaba ng elevator, I just had to go with the flow and line up again as we enter the DFA Consular Office. Yes, iniwan na ako ni auntie at nauna na silang pumasok sa loob. Iba rin yung pila nila sa Courtesy Lane unlike us sa Regular lane. The guards are checking for complete requirements before we enter the office. For the first step, I submitted my appointment application, the barcode was scanned for verification and was given a number for the next station. I just edited out my other information from the application form. The next station is the Processing. I had to wait for my number to be flashed on the screen. While waiting, I noticed a photocopying station at the back. Nagpa-photocopy na lang muna ako ng birth certificate ko, although I have with me 2 original copies (according to others' experiences, they take the original copy). But to my surprise, only the photocopy was taken and then I was instructed to go to the encoding area. Walang binigay na number sakin so akala ko hihintayin na lang akong tawagin. Nakita ko rin si auntie na naghihintay sa Processing area so nakipagkuwentuhan pa ako hanggang sa nakita ko yung sinusundan ko kanina sa pila na nagpunta sa left side corner ng office. Again, I just edited out some of my personal information in the sheet for this blog post. But guess what? I think that was a good thing dahil I got an odd number. Yung sinundan ko sa pila, even number ang napunta sa kanya, and nagkakaproblema sila sa system. Nalalampasan sa nagfa-flash sa screen yung ibang even numbers (kasama yung sinundan ko doon). Nag-ayos na rin ako ng sarili as I was waiting for my turn. After checking if my details were encoded correctly, it's time for the photo capturing. I looked at the camera, ready to be taken a photo of, but was told na hawiin yung bangs ko. I brushed it all to the right and prepared myself again. For the second time, pinahawi pa rin yung bangs ko. Kailangan daw kita yung kilay sa photo. So as expected, another addition to my "Monggi" (mongoloid, as my friends call me) collection, idagdag pa na nag-party party pa kami the night before this. Next is the delivery. If you intend for your passport to be delivered to you, proceed here. If not, then you are done with the process and all you have to do is wait for the date indicated in your receipt and balikan mo na lang yung passport mo on that day. Dahil ayaw ko nang bumalik doon, I chose the delivery option. It costs P150. Nauna pa akong natapos kaysa kay auntie. Mas mabilis pala sa regular lane than the courtesy lane. Fast forward, I received my passport on 15th January 2019. Pretty detailed though parang may kulang eh.. dapat ipakita na ung "that face" sa passport hahaha. peace!